Did you know that you are just a step away from attaining your dream home? 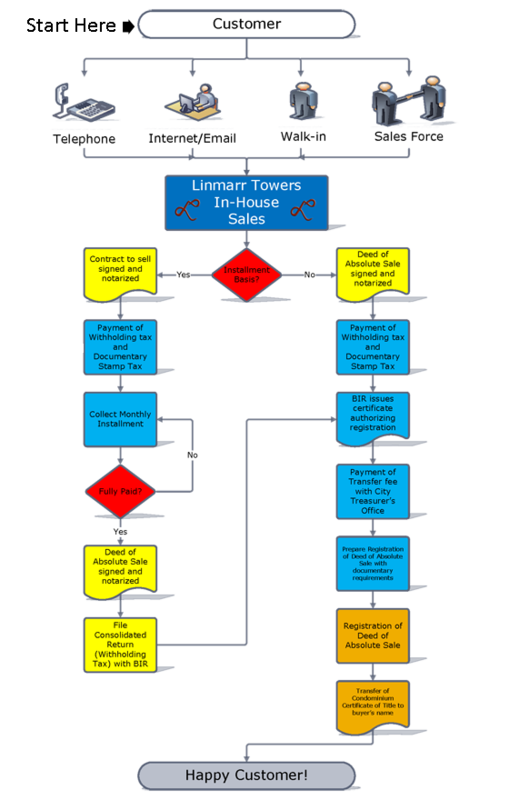 Linmarr Towers will guide and assist you with this easy to follow flow chart. Please hover to or click on an image to view further details. or a foreign national (Note: He/she can purchase a condominium unit under his/her name). 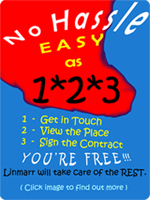 Linmarr Towers offers a simple but reliable solution to make it easy for our customers to get in touch with us. All you have to do is pick up the telephone and give us a call. No matter where you are be it up at the North Pole or the country down under, as long as you have access to the World Wide Web, you can always get in touch with us via electronic mail. Linmarr Towers is just a stones throw away. We will guarantee an accurate and speedy reply to all your inquiries. Our online staff is energized and ready to go all the time. Come, drop by, and visit our place. Check the neighbourhood and see how great it is. When you're done, come in to our office and have a cup of coffee. We have fully furnished display suites for you to view and feel your future home. You can chat with our friendly in-house sales staff. They will be glad to show you around and answer all your questions. Should you decide that Linmarr Towers is for you, our staff consists of fully trained professionals who can handle all your real estate needs. Our sales team are all dedicated professionals who are committed to assisting you with all your real estate needs. They have the knowledge and the experience to serve and help you attain your dream home with the least amount of inconvenience. Search the local residential and commercial real estate listings for Linmarr accredited agents that meets your criteria. Fill up a Call Slip (PDF file) and tell us the unit number you are interested in. We will walk you through the features of the building project and the overall project plans. If you have a representative in the Philippines, such as a trusted relative or friend, you can obtain a Special Power of Attorney (S.P.A.) from the Philippine Embassy in your country of residence, and designate that person to represent you in purchasing a unit at Linmarr Towers. If you have no representative in the Philippines, you may browse through our website to know more about the available units, call us, or send us an inquiry, and we will reply to your questions the best we can. If you prefer, reservations and purchases can be made in your absence. Find out more as we go along this flowchart. You can also make an appointment with us the next time you visit the Philippines. Note: For notarization overseas, you will need to provide us a Certification from a Philippine Consulate or Embassy that the Notary Public/Lawyer being used is duly authorized to administer oath. 2 Valid IDs with picture and signature, preferably issued by government agency, i.e. driver's license, passport, etc. For married couples, copy of marriage certificate. Note that both spouses need to submit the above requirements. Notarized Board Resolution or Secretary’s Certificate stating the ff. Here, you will remit the Reservation Agreement Fee of ₱30,000 which will be applied against/deducted from the downpayment or payment. Payment can be made via wire transfer, cheques drawn on Philippine banks, or cash. If you designated a representative through an S.P.A., he/she may fill up the form and make the payment for you. If you have not already done so, the requirements to be attached herewith are the ones attached with the Customer Data Sheet and Reservation Agreement form. Your signature has to be notarized by either your own lawyer, or our company lawyer, whichever you choose. We will then sign the documents and have it notarized. At this point, you must place a down payment via wire transfer, cheques drawn on Philippine banks, or cash and submit post-dated cheques issued to the order of "Linmarr Towers" as per schedule of payments. If you have no representative in the Philippines, we will send you the Contract to Sell for you to sign, notarized and send back to us. Then, you may send us your payments via wire transfer to our bank in the Philippines. We will provide you with directions if you choose this option. Many of our clients abroad have used this option. A Linmarr representative will prepare all necessary documents and arrange for the payment of the withholding tax and the documentary stamp tax to the Bureau of Internal Revenue (BIR). All of the above documents are required to be signed and notarized. Now you can sit down and relax. Our staff will do all the intricate procedures of making copies, filing, and payment of fees with the corresponding government agencies. If you have no representative in the Philippines, we will send you the Contract to Sell and the other documents for you to sign, notarized and send back to us. Then, you may send us your payments via wire transfer to our bank in the Philippines. We will provide you with directions if you choose this option. Many of our clients abroad have used this option. Note: For notarization overseas, you will need to provide us a Certification from a Philippine Consulate or Embassy that the Notary Public/Lawyer being used is duly authorized to administer oath. The Bureau of Internal Revenue (BIR) will now check if all documents are in order and taxes has been paid. Once approved, the BIR will issue a certificate authorizing registration of the Deed of Absolute Sale (DOAS). Note: The new homeowner need not worry, as Linmarr will follow-up on this procedure. Before proceeding to the Registry of Deeds, Linmarr will prepare and finalize the Deed of of Absolute Sale (DOAS) and make sure that all documentary requirements are in order. The "Deed of Sale" or "Deed of Absolute Sale" is the document showing legal transfer of real estate property ownership. Linmarr will take this deed of sale to the local Registry of Deeds in Davao City to be officially recorded after paying the documentary stamp, transfer tax and registration fees. Here, on this final step, the Registrar of Deeds will officialy transfer the ownership of the condominium unit(s) to the new homeowner and issue the Condominium Owner’s Copy of Certificate of Title (CCT). Please click this Condominium Owner’s Copy of Certificate of Title (CCT) to view a brief description. We will deposit the postdated cheques collected from you without having to bother you each month. Once all payments have been received, we will prepare the Deed of Absolute Sale to be signed and notarized. From here on it's time for you to relax. Our staff will do all the intricate procedures of making copies, filing, and payment of fees with the corresponding government agencies. A Linmarr representative will now prepare the Consolidated Return of the withholding tax paid to be submitted to the Bureau of Internal Revenue (BIR). Linmarr has successfully registered your newly acquired property! CONGRATULATIONS..... ENJOY YOUR NEW HOME! 1) If you live abroad and have a representative in the Philippines, such as a trusted relative or friend, you can obtain a notarized Special Power of Attorney (S.P.A.) from the Philippine Consulate or Embassy in your country of residence, and designate that person to represent you in purchasing a unit at Linmarr Towers. 2) If you live abroad and do not have a representative in the Philippines, you may browse through our website to know more about the available units, call us, or send us an inquiry, and we will reply to your questions the best we can. If you prefer, reservations and purchases can be made in your absence. We can send you the documents needed to be signed and you will send them back together with your payment and all the required documents listed above. You can also make an appointment with us the next time you visit the Philippines. 3) All payments can be made via wire transfer, cheques drawn on Philippine banks, or cash. 4) For more information and details about the documents and forms on this page please visit Resources-Downloads. 5) To view a step-by-step print format, please follow this link Purchasing Guideline and Requirements (PDF file).